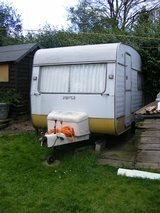 Finding a wonderful used caravan and doing it up is a truly rewarding project. Having the right mindset and putting some time aside will allow you to achieve something fabulous. Although the concept may seem dauntingly expensive, there are plenty of cheats to achieving a beautiful caravan for very little. Start from the inside out and make little changes at first to get into the swing of things. Clean and repair everything. It is far easier to decide what needs attention once you’ve taken this initial step. It will also give you the opportunity to decide whether you restore the caravan entirely or just refurbish it. Classic caravans will retain their value better if they’re kept closest to their original state. That said, a lot of TLC can go a long way. If your seats are looking a little worse for wear, buy some cheap, fire retardant foam from a DIY store and make some envelope-style cushion covers. These can be easily removed for washing. Cheap tester pots of paint are perfect for painting cupboards and some walls. Transfers and Fablon are cheap, fun alternatives to paint/wallpaper. It is the small touches that can create the biggest impact so don’t be afraid to experiment. Charity shops can sometimes have some brilliant finds, especially if you are going for a retro look. Pictures, frames and even vintage fabric can be found if you have time to rummage. Similarly, you can find some great bargains at car boots. Whether you have a modern or retro caravan, let your imagination run free. Take inspiration from the things you love and choose a colour scheme. Flooring is important and doesn’t have to be expensive. Lino tiles are ideal and easy to keep clean. Cover them with rugs if it gets too cold. Luckily, caravans are small enough to not have much floor space, which keeps the cost down. Whatever you use your caravan for, make sure it is an extension of you. There are no limits when it comes to decoration so enjoy it. It isn’t your home so it can be a little more outrageous. However you decide to decorate your caravan remember to take into consideration that modifications and any content value increases should be made known to your insurer. Looking for a cute caravan to turn into your perfect home-from-home and put your stamp on? There’s loads for sale on Preloved, and we’ve pulled together a few lookers that have some perfect pulling power. This ever-popular and classic Puck Eriba from 1976 is as cute as caravans come. Small enough to be towed by most small cars, it provide cosy accommodation for couples. This vintage Mardon Sovereign Orb from 1976 is a complete restoration project, so roll up your sleeves and get set for a labour of love. The reward? Eye-catching accommodation for quick getaways. A 10-foot Piper 75 with bags of character and ideal for restoring to former glory with a little vision and a little more TLC on the outside. The sellers are sad to see her go, and they’re looking for a new home for this Crown 134S, made in 1979. All you have to do is hitch her up and hit the open road! We’re liking the look of this 1973 Viking Fibreline as a great restoration project. The wooden structure needs some attention, but with an original interior and good bodywork and chassis it’s got plenty of potential. Amy is the Head of Community at Preloved. In her spare time, she loves volunteering for a rabbit charity, having crafting weekends and kite boarding in Morecombe which is always combined with a camping adventure! She is always on the hunt for a bargain whether that be at car boots, house clearances or charity shops. Seeing your caravan, car or van growing with green algae is always a sad sight. However, fear not! Here's the Preloved guide on how to remove the green algae from your vehicle. Whether you've bought a project caravan that needs a whole lot of love, or whether you just want to spruce up the interior of your current home from home, our guide on how to design your caravan interior is here to help! Share the motorhome love with this guest blog from There's No Place Like Earl about a lovely staycation to Pembrokeshire! Investing in a caravan needn't be expensive. Here are our top tips to buying a second hand caravan.